Anne is paid to write stories, but she can't any longer. She doesn't know where to begin nor where to end because she ignores her characters directions, their desires, or whether they have any left. And the same is occurring in real life. Anne is paralyzed. How can we decide in such a period of incertitude? 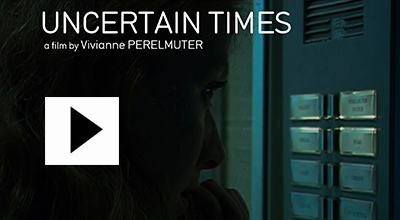 Uncertain Times (Le Vertige des Possibles) is a Belgium-French feature film, produced with the participation of CinéCinéma of the French Community of Belgium and the walloons teledistributors and the Loterie Nationale of Belgium tax shelter du gouvernement fédéral de Belgique Carlier Bois S.A. Fresnoy studio national des arts contemporains. Vivianne Perelmuter, is born in Rio de Janeiro (Brazil). On July 7th, Uncertain Times (Le Vertige des Possibles) was presented to the American student of the CEA. I recalled that originally in Babylon, in ancient Greece and Rome, the City had been created in opposition to the forest which was omnipresent then and surrounded the few inhabitants. Dark like the night even during daytime, threatening, it seemed even more menacing as it sheltered wild beasts; its dense vegetation made orientation and timekeeping difficult. Whereas walls protected and separated. Yes, the City was erected to bring order to a confused world. It was a place where you didn't risk getting lost... contrary to the labyrinth which, strangely enough, is the image associated with today's cities. Why such inversion? Strange times. From now on, the urban universe is the forest of heterogeneous and changing signs, always renewed: signage, advertising posters, neon signs, shop windows filled with merchandise of more or less short lifetime, television in bars, in medical offices, music, radio blaring in public places.We are constantly being solicited. We don't stop flicking channels, so that our experiences have difficulty undergoing sedimentation and tend instead to get reduced to shallow impressions, to scoops, to voyeurism. To garner this contemporary reality and its mutations, I wanted to place myself at the epicenter of all these upheavals, to compose in the disorder and return it in its atmosphere of chocks, inconstancy and incertitude, of turnarounds, of groping, of apathy and flicking. If there is a story it doesn't cease to bifurcate. It does not unfold without snags, linearly and mono-directionally, but proceeds through jumps back and forth, by displacement, digressions. If there is a character, Anne, she often seems lagging and perplex, torn between the fan of possibilities and solicitations, torn between her memory, reminiscences and the flow of the present. She is a writer who doesn't write any longer. A woman always hesitating which way to follow: she thinks or daydreams, and so does not act; she doesn't stop suspending action and poking holes in the situations she is in though her jumps. Perhaps because she acts so little or not all, Anne observes a lot. Perhaps also the situation she's in, in spite of herself, as though 'locked' from the outside, idle, favors a greater availability and a new look into the city she no longer crisscrosses purposefully, or following a well established itinerary and automatisms of habit. This interweaving of documentary and fiction is my way of conciliating the cinema's different desires, to create a force field, a frame in which things will reveal themselves. It is also a way for me to free myself from exclusively logical links, of likely events, and reach new levels of reality. My aim is that, at times, one can't distinguish what is real from what is dreamt or imagined by the character. As such, Anne is filmed from the exterior and the interior, but a slightly stranger interior since it is restored by a narrator with a different voice than Anne's. In the movie, this voice is never found in body and flesh. It has no body nor flesh. all of us and that demands that everything must have a meaning, that each life be a novel. While Anne isn't able to write stories, the Voice of the narrator can't stop doing so. This has nothing in common with writer's block. On the contrary: an excess of stories, a vertigo, no doubt a dispersion, at times a chaos, mirroring a confused times, excited and wary, a time of flicking, stupefaction. Woven of heterogeneous elements, the movie recycles, puts together ancient texts, pieces of cities that reveal time's handiwork, the air of time. That is to say, the cutting plays a crucial part in this movie. It's made up of crisscrossing, of shifting, of superposed time. In fact, the more Anne sinks in to her wanderings, the more she sinks into her past. But her personal trajectory inscribes itself in the framework of the collective future, and one passes without transition from the personal destiny to a collective history. The city itself is a real archive where different layers of History are buried. The past insinuates itself into the present, each parcel of space activates a fragment of memory. It's to say the city in this movie is not simply décor, but an active element, a matrix. Reminiscing the past manifests itself as a whirlwind where personal reminiscences and fragments of the collective memory interlace by playing on associations, on echoes and on gaps as well. I like this idea of gap, that the movie is trying to do the splits by confronting the most pointed present with the most ancient past in order to concretely measure what has changed, all that changes, and at the same time what remains and links. The crux of the matter is not to remember but to learn to decipher. I also like the idea that this movie shelters the odd dimension of the times. Ancient texts rub against telephone conversations of today, chords of modern day guitar hurl themselves against baroque music, car horns, news on the radio, even if sometimes it borders on cacophony. Long shots, where time dilates, contrast with nervous images that accelerate time. Lean passages, quasi-ethnological observations alternate with unbridled moments, more exuberant writing, more lyrical, saturated with sounds and images. was like to live in a transition period. WHAT WILL THEY SAY OF OUR TIMES? Anne wonders constantly. I filmed with this question in mind. Filming as though my epoch was passed, like an Egyptologist deciphering hieroglyphs, an archeologist ancient ruins. It is the distance I need to close-in to the real, to see better, like a painter stepping back from the canvas. I share with Anne a 'lack of tranquility' and I often feel, like her, vertigo of the possibles.